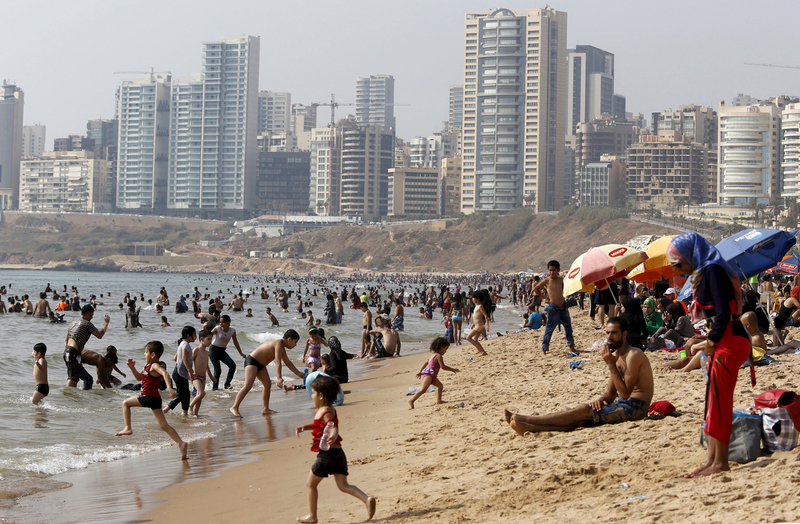 Lebanon's Shrinking Public Beaches : Parallels In a country with a stunning coastline, a lack of governance has allowed private developers to gobble up prime seaside real estate and shunt aside ordinary Lebanese who depend on public beaches. Lebanese gather at a public beach in Beirut on Aug. 2. Lax governance has allowed developers to turn much of the coastline into private clubs, leaving a dwindling number of public beaches along the Mediterranean. The sun is beating down on the rocky shore of Lebanon's capital, Beirut, and architect Mona Hallak is taking her son and his friends to see their heritage. "Who knows how to swim?" asks Hallak, an advocate for public beaches in Lebanon. The kids say they can, but they learned in private beach clubs. Hallak tells them of the past, when Beirutis learned to swim in the sea because the shore was all public. She shows them a nearby area that was open and has been fenced off. She fears it, too, will be built on as many other places have been. Taking the kids on a boat, Hallak shows them flinty cliffs and outcrops and tells them they should be open to anyone, any time. "We don't want it to be private, we want it to be public, right?" she says. In an odd twist, Lebanon's 15-year civil war from 1975 to 1990 kicked off a frenzy of coastal development in Lebanon. Businesses and developers took advantage of the chaos to build more than 1,200 illegal structures, according to a government report. And now, although an old law says the shore is public, incremental legal changes and loopholes allow more and more beach clubs and hotels to be built. "It's unbelievable that you are in a country that has a coastline that you cannot access as a citizen except by paying money to a private developer," she says. The few public beaches remaining are not well-maintained. There's even a stigma attached to them, a perception that only poor people go there. An academic study found 29 percent of respondents wouldn't go to a public beach because they'd be embarrassed if someone they knew saw them. Hallak is part of a campaign to have the beloved rocky chunk of Beirut's coast, known as Dalieh, designated a conservation area so it can't be built on. And actually, there's one place where this has worked. In the southern city of Tyre, the shore is protected because it's home to rare turtles and plants. No permanent building is allowed and a wide golden stretch of sand is public. The beachgoers in Tyre are noticeably different than at the private beach clubs. "You see larger variety in terms of backgrounds, socioeconomic backgrounds, age groups," says Dalya Farran, who runs a cafe in a shack here in the summer. "People from all around Lebanon come to this beach." The beach is clean because each cafe manager cleans their own patch. It's free and beautiful. People come from all over — not just rich and poor, people from Lebanon's many different religions, too. Women in bikinis splash next to modest Muslims in full-body swimsuits. Farran calls it a space of freedom. Hussein Shaheen, who is here with his daughters, says the beach is supposed to be for all the Lebanese people. He says he worries a developer will build here one day and it'll be too expensive to come. "Can we keep the beach free?" says his daughter Nisreen. And then she goes to join her sister in the sea.